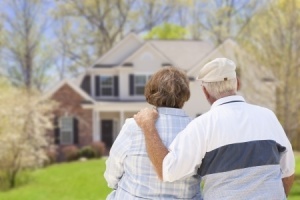 Thirty percent of Americans 65 years and older are carrying a mortgage into retirement. They are also trying to figure out how to handle the payments. No one really wants to carry a mortgage into retirement. However in many cases it can just not be avoided. There may be health issues that take a lot of money. There might have been a divorce or separation. Also there may be children’s education to pay for. Or maybe you just spent too much and did not plan properly. In many cases, consumers have been laid off from a well paying job. They find themselves unable to find another job. Effectively putting them into retirement. Whatever the reason, carrying a mortgage into retirement can be difficult for some. At the very least it will limit the things you plan to do during your retirement. Cash flow is all important in retirement. The bottom line is that there is only so much money coming in each month, your expenses will eat into that income. Your mortgage that you carry into retirement will eat into this cash flow along with your expenses for living, visiting the grand kids etc. If you are young enough to plan in advance, make every effort to repay your mortgage in full prior to retirement. You will have all of the cash you need to live your life. Many people will use a line of credit to help them deal with situations where they do not have the cash to handle various situations. While these are excellent tools, there is the danger of using them and then finding that you cannot pay them off quickly since the cash is just not there. Folks in this situation have much less flexibility in spending due to the cash flow impact. That $400 or $800, whatever the mortgage payment is, is money that you don’t have to enjoy in your retirement. Other pressures such as putting students through university, unemployment, retiring early, health expenses etc. can affect your ability to repay the mortgage. Even if you have a line of credit against your home which you consider a loan, make sure that it is fully paid before you retire. We see lots of people spending a lot of money in the years before they retire to upgrade the house, buy a car, major repairs to their home etc. If you have the cash to pay these major expenses great, if not make your cash last as long as possible to avoid serious cash flow issues. Pay off high interest loans first, then focus on low interest mortgages. By taking this approach you can at least minimize the amount of interest you are paying each month. For more life style topics, click here. This entry was posted in Debt Reduction and tagged Mortgage Info on 2014/12/07 by ernie. There has long been a discussion around whether variable rate interest rate for mortgages and loans are better than a fixed interest rate for these same financial vehicles. The debate always gets interesting when interest rates are about to change. Consumers get worried whether they will end up paying more interest because rates are rising and they did not lock in soon enough. Conversely many consumers also worry that they locked in too soon when interest rates start to fall. So what is the right strategy for consumers around this huge issue of fixed vs variable interest rates? After all it is your money. Well , we think there are a number of factors to consider and they will vary in importance for most people. As a result it is a very personal decision based on the financial position you are in. The plans you have for the future regarding your property and you ability to deal with risk associated with changing interest rates. We will try to discuss the major issues and provoke people to think about their situation before they make a decision. At the present time in early 2016, it looks like interest rates will stay flat for another year. You can never tell when they will change, but that is what the experts are saying at the present time. A fixed interest rate loan or mortgage is just that. The interest will not change for an agreed to time frame, usually called the “term”. At the end of the term, the bank will offer you a new interest rate and term for your loan or mortgage if you have not already paid it off. A variable interest rate loan or mortgage will vary in relation to the prevailing bank rate announced by the Fed in Canada or the United States. If it goes up, your bank is likely to increase the rate they charge you. If it goes down, they will lower the rate they charge as well. When the bank rate is, let’s assume 2%, then the banks will charge you one or 2 % over that level. It depends on how competitive your bank is for a total interest rate of 3 or 4%. These factors are not listed in any relation to importance, since individual consumers may rank them quite differently based on their personal situation. Stress – Some people just cannot deal with the unknown of whether the interest rate will change and whether your monthly payments will change or not. If it keeps you up at night worrying, why put up with that , lock it in. Changing Monthly Payments – each time the interest rate changes, the amount of interest you owe and the corresponding monthly payment will change. As long as it is going down it is ok, however if the interest rate is going up and if there is going to be a significant impact on your budget, then you may want to switch to a fixed interest rate loan or mortgage. When you sign up for a fixed rate mortgage you are saying that you will pay a certain amount for the life of the term based on the agreed to interest rate. If you plan to sell during that period of time and the interest rates have fallen, the bank is going to charge you a penalty plus administration fees to discharge the mortgage when you sell your home. The penalty will roughly amount to the difference in your rate and the rate that the bank will lend the money out at the time you close. This can amount to thousands of dollars, so it is good idea to think about this. With a variable rate mortgage often you will only pay the administration fees to discharge the mortgage. Saving Money – Variable rate loans and mortgages often have lower interest rates than the fixed rate loans and mortgages being offered by banks. This is only true at the time you take out the mortgage. 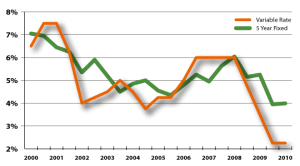 Interest rates do change and they can go up and down, however at the time you sign, the variable interest rate is usually lower than the prevailing fixed interest rates. This is an excellent way to save money especially if you feel that for the foreseeable future , interest rates are not likely to change much. In periods of high inflation or in periods of economic down turns and depressions / recessions, the interest rate that is quoted by the banks can change often. During periods of economic growth and high inflation interest rates tend to rise. During recessions and depressions, interest rates tend to decline in order to stimulate the economy and get things moving. Consumers should take this forecast of interest rate volatility into account when they are making their decision along with the other factors mention as part of their decisions to take a variable or fixed interest rate loan or mortgage. Competitive Rates – Many news papers will list current interest rates offered by banks and other lending institutions each week. For the most part they are all pretty close since competition is pretty fierce, however it never hurts to have a discussion with your loan officer to see what kind of deal they may give you. Sometimes even shaving a quarter percent off can make a big different in the total amount of interest you pay. It never hurts to ask and the worst that will happen is that they will say no! Assess your risk tolerance for changing interest rates. Assess the impact on your monthly payments. In addition assess your plans to sell or keep your home over the next several years. Also where do you anticipate interest rates are headed as inputs to your decision. Note that you can and should compare fixed and variable interest loans and mortgages from various companies to ensure that you obtain the most competitive rates. This entry was posted in Investing and tagged Mortgage Info on 2010/02/28 by ernie.